In this video, you will see just how easy it is to assemble a basic, stationary starter unit. In your package, you will receive all the components needed to assemble a complete starter unit with four shelves. The only tools you will need are a rubber mallet and a level. Also, it is best to have an additional person to assist with the assembly. Basics stationary starter units ship with pre-assembled post kits. You should have two stationary post kits to build a starter unit. We're going to begin by installing a set of dove tails onto the post. Take a set of dove tails, 1A and 1B dove tail. The A dove tail will be installed on the right side and the B dove tail on the left. We will now install the traverses onto the basics stationary starter unit. It is time to complete our assembly by adding the shelf plates. Place all the shelf plates onto the traverses. The last step is making sure you level the shelving unit to make sure that it is evenly positioned, leveled front to back, and side to side. Do not climb or stand on shelving. 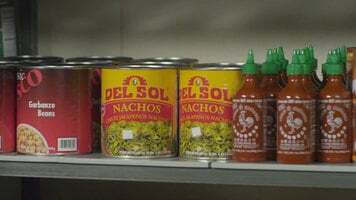 Place heavy objects on lowest shelf. Use a dunnage stand when storing heavy items. Distribute weight as evenly as possible. There you have it! We have just assembled a Basics series starter unit. You can count on Cambro to be on the leading edge of technology, innovation, and food safety. 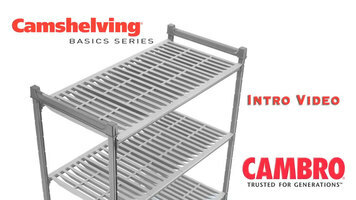 Your complete shelving solutions from Cambro. Cambro CBU243084S5580 Camshelving® Basics Plus Solid 5-Shelf Stationary Starter Unit - 24" x 30" x 84"
Cambro CBU244284V5580 Camshelving® Basics Plus Vented 5-Shelf Stationary Starter Unit - 24" x 42" x 84"
Cambro CBU214284VS5580 Camshelving® Basics Plus Stationary Starter Unit with 4 Vented Shelves and 1 Solid Shelf - 21" x 42" x 84"
Cambro CBU215464V5580 Camshelving® Basics Plus Vented 5-Shelf Stationary Starter Unit - 21" x 54" x 64"
Cambro CBU215484S5580 Camshelving® Basics Plus Solid 5-Shelf Stationary Starter Unit - 21" x 54" x 84"
Cambro CBU216084VS5580 Camshelving® Basics Plus Stationary Starter Unit with 4 Vented Shelves and 1 Solid Shelf - 21" x 60" x 84"
Cambro CBU184864V5580 Camshelving® Basics Plus Vented 5-Shelf Stationary Starter Unit - 18" x 48" x 64"
Cambro CBU184872VS4580 Camshelving® Basics Plus Stationary Starter Unit with 3 Vented Shelves and 1 Solid Shelf - 18" x 48" x 72"
Cambro CBU185472V5580 Camshelving® Basics Plus Vented 5-Shelf Stationary Starter Unit - 18" x 54" x 72"
Ensure your storage area stays organized with Cambro's innovative Camshelving® Basics line. Each piece is lightweight yet extremely durable and resistant to scratching, peeling, or corrosion. Keeping an organized kitchen is one of the key things in maintaining efficiency and productivity - that’s why you need Cambro Camshelving®! Durable and rust-resistant, Camshelving® is the perfect solution for your busy kitchen. 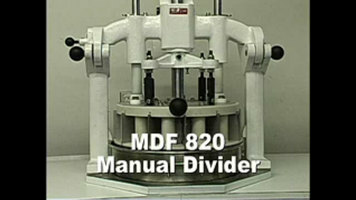 The Doyon MDF 820 manual dough divider is a simple way to pre-portion the dough you need for your bread, pizza, and more!